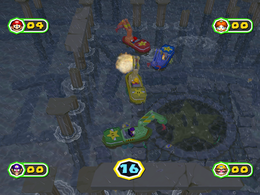 Treasure Trawlers is a 4-player minigame in Mario Party 6. The only change between day and night is that it is raining at night. This minigame is featured on a page of the Miracle Book. 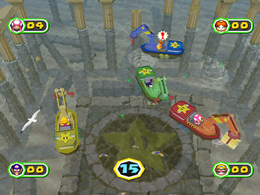 The players drive up to the center of the arena in their aquatic vehicles. They then face the screen. All the characters are in some kind of construction crane boat, floating on a pool of water. The players must keep moving around until their controller (or if a "!" appears over their head if the rumble setting is turned off) rumbles, then they should press to let down their crane. If the crane pulls up a treasure chest, the player earns one point. If it pulls up a golden treasure chest, it gives them three points. If a Bob-omb is pulled up instead, the player is stunned temporarily. The person with the most points at the end of the minigame wins. The players line up where they are. The crane on the winner's boat then moves up and down. Rules – "Find and recover the sunken treasure chests on the seafloor! Your Controller will rumble when you pass over a treasure chest." Advice 1 – "Each treasure chest is worth one point. Golden treasure chests are worth three points. Bombs will temporarily stun you." Advice 2 – "If the Rumble Feature is turned off, an "!" will appear instead." This page was last edited on December 5, 2017, at 00:16.